Rabbit a La Berlin, a film by Bartek Konopka and Piotr Rosołowski which will be screened on Wednesday 20 August, examines the plights of a colony of rabbits which lived between the two barriers of the Berlin Wall. 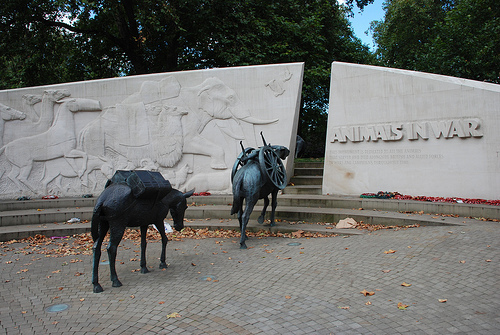 Enclosed in this space, the animals lived undisturbed lives – until the Wall was taken down. Then the rabbits had to readjust, and learn to live in a new environment (much like the people, of course, who had to unify what was once West and East). 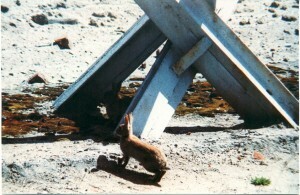 The rabbits who inhabited the “death strip” between the West and the East are not the only example of nature caught in human conflict. Animals such as horses and dogs have long been used by the military, but the impact of war can go far beyond such matters of “utility”. As a human endeavour, war and armed conflict can have a profound impact on the environment and natural systems: landscapes, for instance, have been transformed by advancing militaries and migrating populations. What is more, this impact is not only inflicted during the fighting of war. Military preparations, such as training and the development of a military infrastructure, also affect the environment. And in the aftermath of war, reconstruction once again leaves a mark. The Cold War, in this respect, presents a specific example, in which a conflict was not actively fought (at least in the European arena), but nonetheless dictated human activities and shaped their movements. It therefore also affected the natural elements of this continent. The rabbits in the “death strip” lived happy, untroubled lives because no people or natural enemies were present in the enclosed space. In another case which mirrors the Berlin rabbits’ story, groups of deer also felt the effects of the Iron Curtain, which stretched into what was then Czechoslovakia. At the time, three parallel electrified fences presented a heavily guarded border: over the years, 500 people were shot as they tried to escape into West Germany. The barrier would now traverse a combined German/Czech national park, where a wildlife crossing has been made to aide red deer who migrate in the summertime. However, a recently concluded study shows that the animals in the Sumava Natural Park in the Czech Republic now balk at crossing the area where the fences once stood. The animals on the German side present the same behaviour. 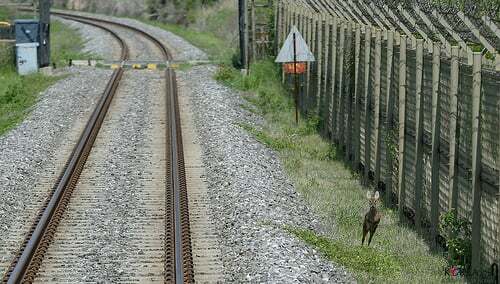 Where people are now freely crossing political borders, the deer seem to have kept the Cold War distinction “in mind”. With the 25-year anniversary of the fall of the Wall, none of the deer living today would remember the fence as it stood. Red deer typically live for 15 years, meaning that the animals now fearful of the traverse are at least of the second generation since the fall – implying that fawns would have adapted their mothers’ migratory behaviours in avoiding the barrier. The Cold War is not the only case of a conflict that is characterised by a stand-off. It still echoes in the relations between North and South Korea that have been restrained for decades, a fact that is represented by the so-called Korean Demilitarised Zone. It lies on the original boundaries between the US and USSR brief administrations of Korea post-World War Two, and was reinstated in the 1953 Armistice Agreement that ended the Korean War. The DMZ roughly divides the Korean Peninsula in half: it is 250 km long and four meters wide, extending on both sides of the front line. It is a buffer zone, with large numbers of troops still stationed alongside it. Only two small villages remain within the boundaries of the DMZ; the rest of the zone is a deadly place for people as the area remains heavily patrolled and tensions are still high. As a result, the DMZ has become an involuntary, unintended wildlife park. The area encompasses a unique geography including mountains, prairies and swamps – and thus is a unique temperate habitat. It is home to a number of near-extinct species: the Korean tiger, Amur leopard and Asiatic black bear are free to roam this “green ribbon”. While the guns and land mines are keeping people out, they are de facto keeping other species alive. One important note, however, is that this ecosystem has a precarious future: demilitarised zones might not remain in that stage indefinitely, and especially not if a war were to break out. Should the tensions between the two Koreas become hotter, the troops now lurking on the border will cross the DMZ, destroying its unique ecosystem. In a telling occurrence, South Korea’s submission to UNESCO to create an official wildlife park in the southern part of the DMZ, has been blocked by North Korea as a violation of the armistice agreement.